What really defines the boundary between celebrities and the rest of us? Step inside Adam Axford's realm and find out in his latest show, Make Me Famous. If you haven't yet witnessed Adam Axford live you're in for a treat. 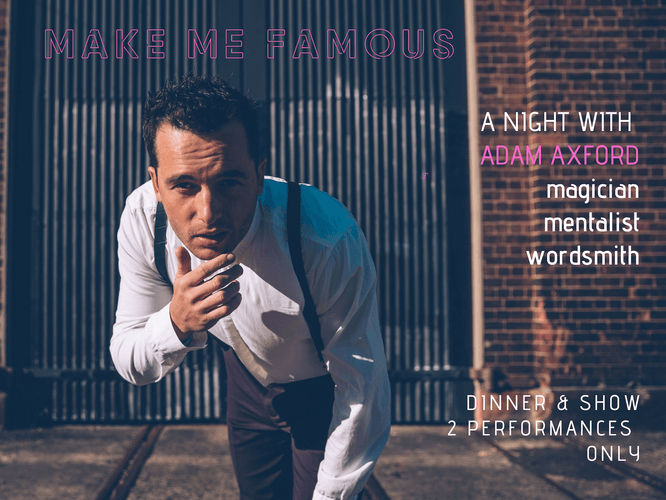 Part wordsmith and part magician, Adam delights and challenges audiences across the country with his unconventional and refreshing performance. Born and raised on the streets of London, Adam's style is equal parts poetry, hypnotherapy, and yes, perhaps even real magic. Each breathtaking piece is fully interactive, refined to perfection and entrenched in meaning. Ticket price includes four course dinner and show, with a cocktail on arrival. Firefly Bar & Dining is an intimate venue with just sixty seats offering full table service and an extensive wine and cocktail list. Most dietary requirements can be accommodated, please notify the venue directly prior to the evening. There is plenty of parking near by and public transport options. Due to the nature of the show this is an over 18s event.